Cook the quinoa and barley according to the packet instructions and allow to cool. 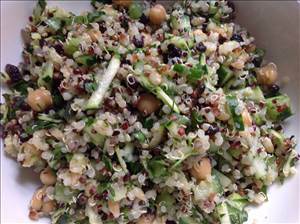 Once cool combine in a large bowl the quinoa, barley, chickpeas, cucumber, celery, currants, zucchini, coriander, mint and parsley. Make the dressing by combining the olive oil, apple cider vinegar, garlic powder, ginger, lemon juice and zest. Refrigerate for a few hours to let the flavour develop. There are 228 calories in 1 serving of Quinoa, Barley & Chickpea Salad. Calorie Breakdown: 29% fat, 58% carbs, 13% prot.